Welcome to our company Lesvos Car Hire. With over 20 years’ experience in car rental, we are one of the leading independent car hire agencies on Lesbos Island. We deliver all over the island for your convenience including Mytilene Airport, Mytilene Port and new for 2018 we will deliver our cars, Scooters, Jeeps, people carriers & other specialist rental vehicles to the Port of Petra. Our rates are calculated on a daily basis to accommodate your requirements whether you want simply a few days rental to see the highlights of Lesvos or a longer rental for your entire stay. We not only deliver to the Airports & Ports but also to your Hotel. Our representative will meet you by appointment in your accommodation & collect the vehicle from there too. We have been successfully providing excellent service to our customer’s rental needs since 1993 from our walk-in office in the holiday resort of Anaxos, located in the north of Lesvos Island. We think people come to us for their car hire and scooter rental because they know we offer great prices as well as a friendly and reliable service. We try to keep things simple so that you enjoy the best possible experience. We also hope that when booking your vehicle hire through us, it becomes part of a really fantastic trip with memories that last a life time. Our Customers come back to us year after year because of the personal service we give and with the vast amount of local and island knowledge we have to happily share with you. With every booking we supply an information pack that includes: a road map, suggested driving routes around all regions, simple language guide, frequently asked questions about Lesvos, and places of interest to visit. 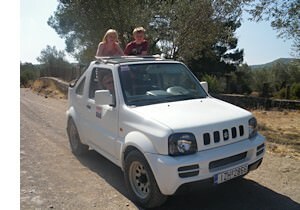 This has been compiled by us and is unique to Lesvos Car Hire. Included in all our rentals for your peace of mind: Our customer support line which is open 24hrs a day, every day of the week, as is our roadside assistance, so when you need us we will be there for you. OUR AIM: To provide excellence in our service to you, quality in the product we supply and help enhance your holiday experience. OUR MISSION STATEMENT: To under promise and over deliver.